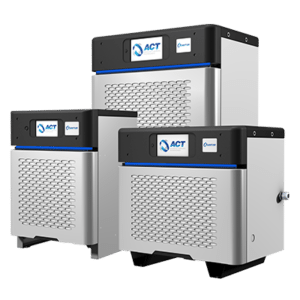 La Mirada, California, August 29, 2017— Advanced Charging Technologies Inc. (ACT) is pleased to announce that it has completed the UL/cUL certification for the 380VAC and 80V Quantum chargers. The new 380VAC chargers will expand Quantum sales into Latin and South America while the 80V chargers will allow ACT to meet growing demands for 80V forklifts. The 80V Quantum charger also lays the groundwork for ACT to enter the airport ground support equipment (GSE) market. “This represents another milestone in the Quantum product line expansion. The new products will allow ACT to exploit new market opportunities,” comments ACT President, Bob Istwan. The Quantum charger, the industry’s first smart battery charger, was designed with WiFi connectivity to allow for seamless cloud integration. ACT’s cloud application with simplified dashboard allows end users to centrally manage their charger assets with 24/7 access from their desktop, mobile phone or tablet enabling real-time smart warehouse management. “The 2-way communication allows remote firmware and software updates for continuous improvements as well as remote commands to be sent to the Quantum charger to solve problems before they happen”, comments Dr. Nasser Kutkut, Chief Technology Officer of ACT. The Quantum charger also communicates with the ACT BATTview battery monitor to capture battery utilization & performance data for even more cloud-based, real-time optimization of forklift charger and battery fleet efficiency. The Quantum charger features modular technology for uninterrupted operations, ease of service and scalability. Power modules with a plug and play interface can be added or replaced easily as operations and power needs grow. The Quantum charger is UL/cUL certified, CEC compliant, and is backed with a 5-year warranty by ACT. About ACT: Advanced Charging Technologies (ACT) is a high-tech company offering a complete line of battery management products including intelligent high frequency conventional, opportunity, and fast battery chargers, advanced battery monitors, and cloud-based monitoring and management solutions serving the industrial motive power battery market. ACT’s portfolio of battery and charging solutions are sold and serviced exclusively through the Deka Battery Dealer Network (East Penn Manufacturing Co., Inc.), the world’s largest and most modern independent battery manufacturer. Visit www.act-chargers.com for more.